Our research focuses on degeneration and regeneration of musculoskeletal soft tissues, primarily the intervertebral disc in the spine. Using tools of bioengineering, we study the biomechanics and mechanobiology of cells and tissues, with emphasis on degradation processes and inflammation. We also collaborate with physicians in the departments of Orthopedic Surgery and Rehabilitation Medicine, to develop biomarkers of intervertebral disc disorders and back pain. We are grateful for the funding support from the National Institutes of Health (NIH), the National Science Foundation (NSF), New York State Department of Health (ECRIP program), and the American Orthopedic Society for Sports Medicine (AOSSM). Intervertebral disc (IVD) degeneration in patients is associated with chronic elevated levels of multiple pro-inflammatory cytokines, indicative of the important roles that inflammatory mediators play in the degenerative etiology. We have developed an animal model, using direct intradiscal stimulation of innate immunity in the IVD, to explore the role of inflammation in triggering degeneration. We are studying novel inflammatory and injury mediators (HMGB1) and their signaling through toll-like receptors in IVD cells. We find that inflammatory insults alone, in the absence of traumatic injury, triggers degeneration of the IVD. This is physiologically relevant because we have identified a chemical trigger and disease mechanism of degeneration that mimics the molecular profile of human disc degeneration and may be amenable to pharmacological treatments. We are evaluating pharmacological inhibitors of these pathways for the treatment of IVD degeneration. Disc cells are mechanosensitive, capable of responding to mechanical stress over a wide dynamic range of external mechanical stimuli. We are investigating how inflammation alters the biomechanical properties, deformation behavior, and mechanosensitivity of cells in the IVD. Our studies provide evidence that inflammation alters disc cell biomechanical properties and cytoskeleton, leading to alterations in cell mechanobiology. We use atomic force microscopy (AFM) for studying contact mechanics, in the context of cell biomechanics of aging and inflammation. Using microfluidic techniques and theoretical modeling, we study changes in cellular hydraulic permeability. Using FEBio finite element modeling, we are generating predictions of in situ deformation and stress microenvironments in disease states. Measuring and modeling consequences of inflammation on cell mechanobiology provides insight into the multiscale environment of cells as they adapt to changes occurring in aging and degeneration. In collaboration with surgeons at The Spine Hospital at New York Presbyterian and Lenox Hill Hospital we have embarked on multiple prospective observational clinical studies related to spinal degeneration and back pain. 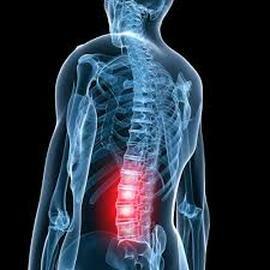 We are investigating potential systemic biomarkers of IVD disease severity and back pain. To date we have enrolled over 200 clinical subjects. Our findings indicate that back pain patients have elevated systemic inflammation, in a manner that depends on the diagnosis of the disc pathology. These findings confirm our hypothesis that inflammation is a driving force of pain propagation associated with spinal degeneration. We have identified a profile of mediators that are correlated with improvement in pain and disability with epidural steroid injection treatments, in collaboration with physicians in Columbia's Department of Rehabilitation and Regenerative Medicine, and The Spine & Pain Institute. Our studies are identifying markers to accurately predict response to treatment, which may be a more powerful indicator of outcome than commonly used spine radiological examinations. Engineering regenerative strategies for musculoskeletal repair has specific biomechanical, cellular, molecular and nutrient supply demands. The degree of degeneration also impacts the therapeutic potential of cell based repair. Consequently, conditions for achieving clinical efficacy with cell-based repair must be optimized. We are evaluating and optimizing the biomechanical responses to stem cell based repair, anti-inflammatory and MMP inhibition therapies. We are also developing novel 3D printed scaffolds with optimized functional biomechanical properties for load bearing applications.